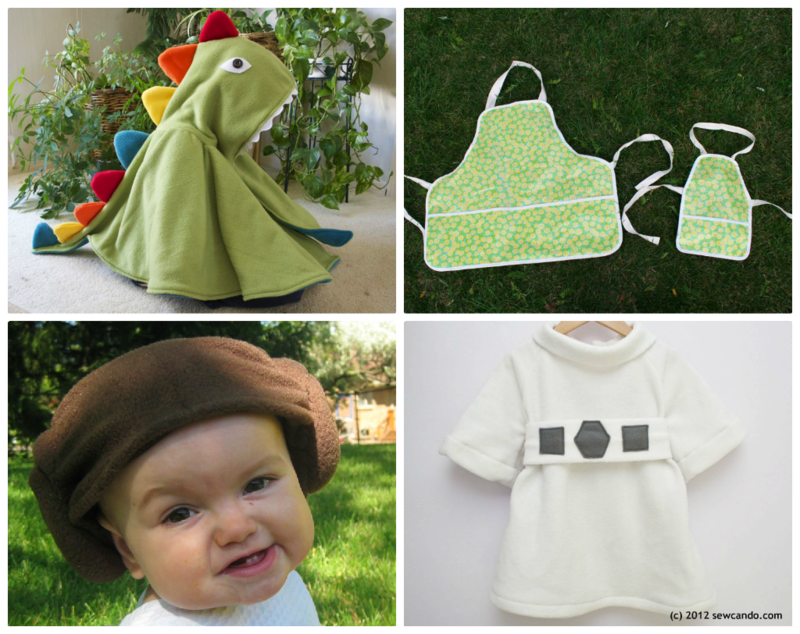 Sew Can Do: Dynamite Dinosaur Cape & Kid's Costume Pattern Giveaway! 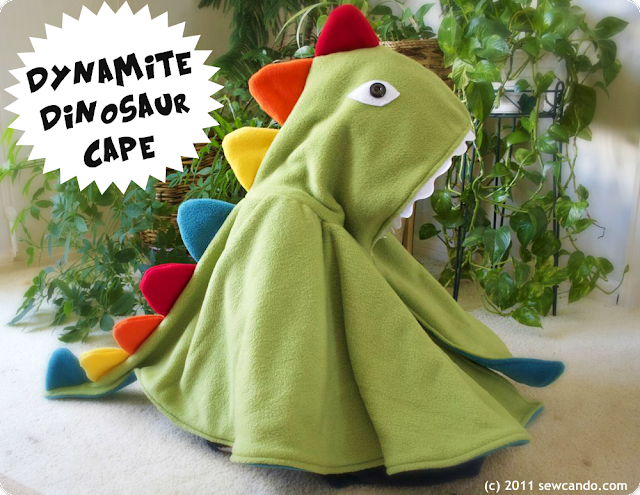 Dynamite Dinosaur Cape & Kid's Costume Pattern Giveaway! Halloween is just a few weeks away, so I thought now would be the perfect time to share my Dynamite Dinosaur Cape PDF Pattern and give a few copies of it away! 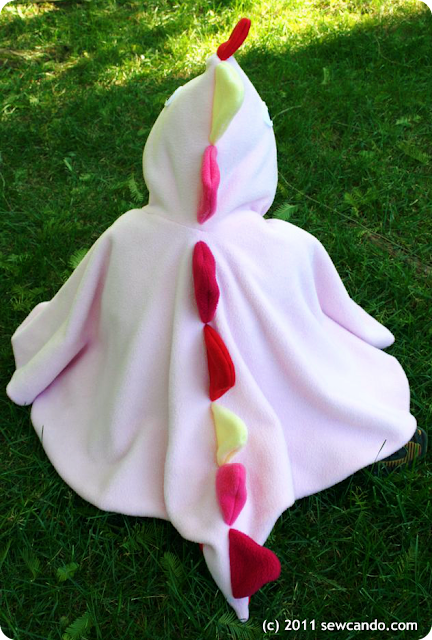 I designed this cuddly fleece cape with colorful spines that go all the way down to the tail. The hood has large dinosaur eyes with button details. Teeth around the mouth of the hood give this cape some extra "bite"! 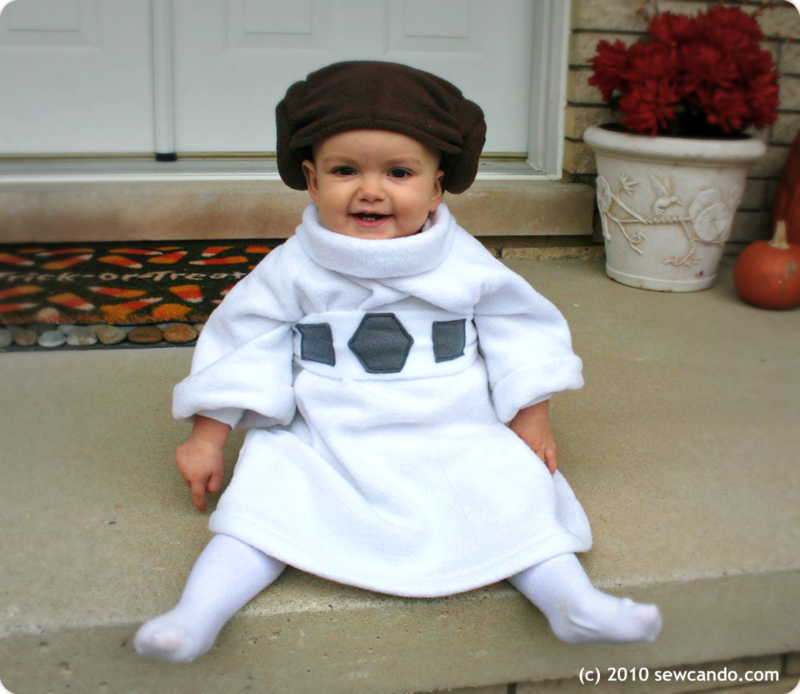 The cape is also fully lined, so it's perfect for staying warm while trick-or-treating. 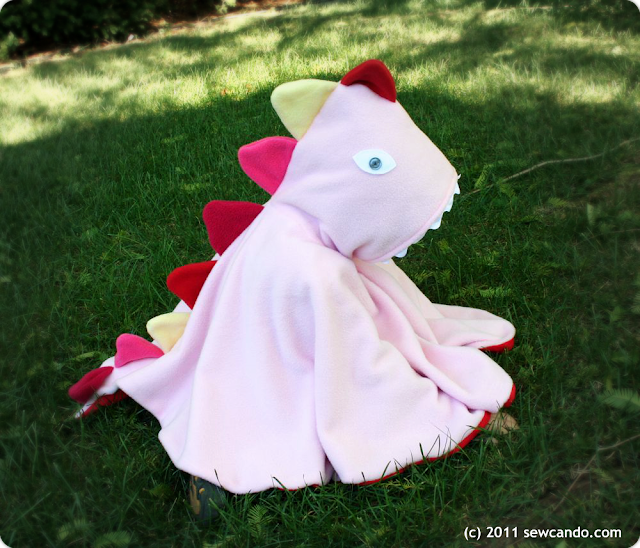 Having a snap closure at neck keeps cape on while the little dinosaur runs and plays. The generous size fits approximately 3-7 years, so it can get multiple years of enjoyment too. Or try just about any color combo for a unique look. 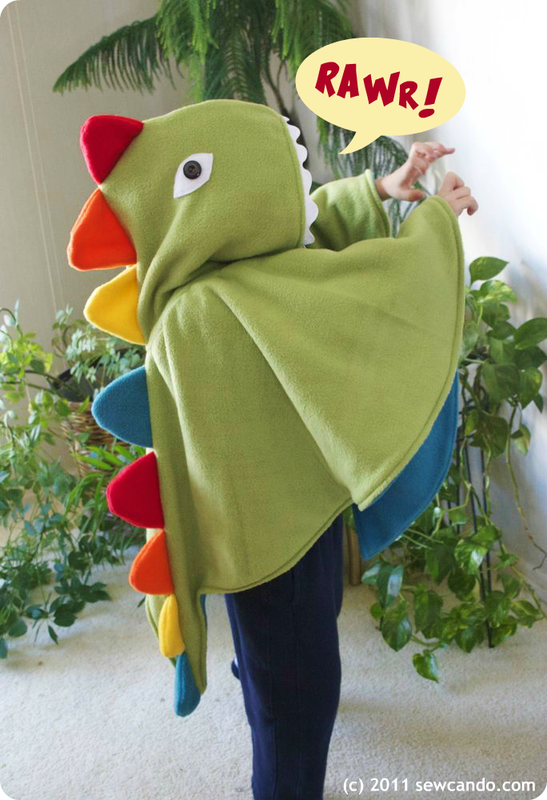 This pattern makes the perfect costume for Halloween or playing dress-up because it's so easy to wear - just slip on over any coats or clothing and instant dinosaur transformation! But I've decided to give away a few patterns to FOUR lucky winners! That's over $25's worth of patterns the kids will love! Just stop by my shop, The Green Hedgehog, and leave me a comment below telling me your favorite pattern. Be sure to include an email address if it's not on your profile. Giveaway IS CLOSED will be open until 11:59pm EST October 13th, 2012. Giveaway is open worldwide. Void where prohibited. The winner will be chosen at random and announced later that week. Good Luck Everyone! I LOVE the dino cape!!! How perfect for trick or treating in cool weather places. OHh yay this is drawn on my birthday - might get an extra pressie. Love the dinosaur cape and the emmeline bonnet. the space princess (princess leia!!!) is my favorite! may the force be with us!!! The dinosaur is adorable !!! I have a little boy who would LOVE that ! I adore the Dinosaur cape. That's just so cute. I also really like the Reversible Emmeline Bonnet. I've already 'liked' Sew Can Do on Facebook previously. the space princess gown is so adorable! I like the reversible serena baby dress. Love the Dino Cape pattern. So cute. My favorite one is the Dynamite Dinosaur Cape PDF Pattern. I would like to make the pink one for my granddaughter Nellie. She would love it. I follow Sew Can Do on GFC as Mrs. Kathy Davis. I LOVE the dinosaur cape - so fun!!!! I have liked your Facebook page for a long time! LOVE that Dinosaur cape!!! AND I am drooling over that ruffled bonnet!!!! Thank you for the opportunity to grab some of your amazingly creative patterns!!!! Fantastic Designs! Of course I love the dino cape. I have two little boys who could be a different dino every day. The handbag caught my attention, what stunning colors and a sweet, modern design. The cape is definitely my favorite. My son would love it if I made him one! I like The Green Hedgehog on FB! I like the hair hat. It makes me smile every time I see it! I like the Around Town Reversible Bag Pattern. I like The Green Hedgehog on facebook.